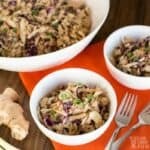 A quick and easy Thai chicken salad with canned chicken that tastes amazing. 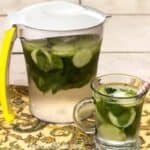 It’s simple to prepare and made with budget friendly ingredients. The dish is sure to become a regular! I was fooling around in the kitchen a couple weeks ago and came up with an awesome Asian inspired salad I just had to share! Since I’m dreaming of warmer weather, I wanted to work on some cold salad recipes. Although perfect for summer weather, these dishes are great year round. I love that I can just grab a small small bowl of this easy Thai chicken salad with canned chicken and eat it right from the fridge. 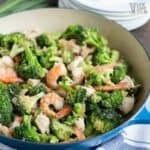 And, I know you guys are going to love how quick it is to make this simple dish. In fact, you should be able to finish the recipe in about five minutes. 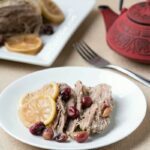 What makes this recipe so quick? I’m using pre-made coleslaw mix and chicken salad in the ingredients which saves prep time. Of course, you can always cut the vegetables yourself if you prefer. And, leftover chicken is a fantastic substitute for the canned chicken. I’ve been eating primarily organic chicken so I used Wild Planet canned chicken. It is a more expensive than the regular brands, but I feel it’s worth it. I purchased all my ingredients at Whole Foods Market. It’s a further drive than my regular store, but I find the produce is much fresher there. This easy Thai chicken salad with canned chicken is such a simple recipe. You should be able to find the ingredients at any market. And, it shouldn’t cost much. I’m loving this dish so much that I plan to make it for our potluck parties. It’s just one of those recipes I’ll be making over and over again. Traditionally, the dressing for the salad would use peanut butter. However, I’ve been avoiding peanuts as it’s a legume that contains lectins which don’t digest and phytic acid which is a harmful antinutrient. Instead of peanut butter, I found Keto Butter made by Perfect Keto. It tastes really close, but it’s made with macadamias, cashews, coconut butter, MCT oil, vanilla bean powder, and salt. And, using code LOWCARBYUM saves you 20%. 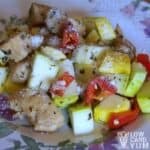 The Keto Butter product is a great substitute for peanut butter in this easy Thai chicken salad with canned chicken. I prefer it over sunflower seed butter or almond butter. I was able to get an advanced sample of the product. It’s currently not available yet. But, I’ll be sure to give it a shout-out when it’s released. It’s the best peanut butter substitute I’ve tried. Be sure to sign up for my newsletter if you are interested in getting the special notices I send out to readers. 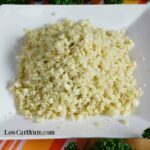 And, when you sign up for the free service, you’ll get a copy of my Low Carb Tips and Tricks eBook. 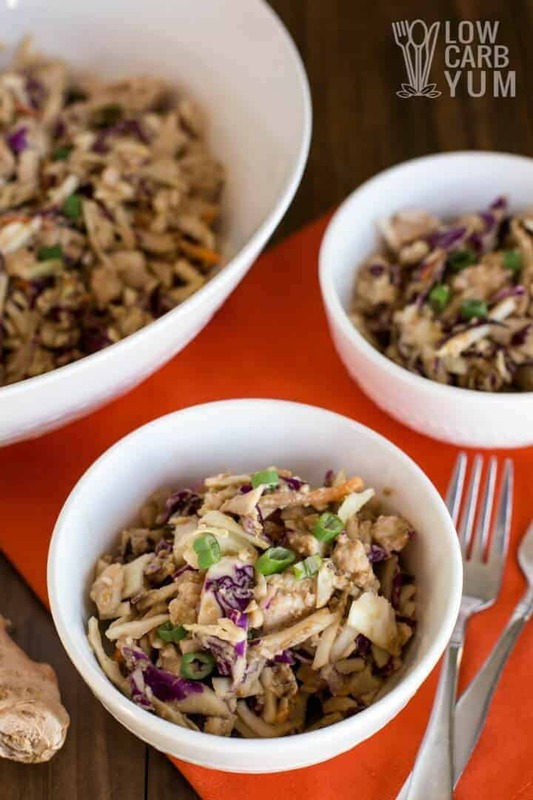 Getting back to the easy Thai chicken salad recipe with canned chicken… If you aren’t one who likes cabbage, the broccoli slaw mix is another option you can use. And, the sweetener in the dressing can be replaced with whichever one you prefer. The fifteen drops of stevia is equal to about a tablespoon of bulk low carb sweetener. If you like your dressing a little spicy, feel free to add in some red pepper flakes or hot sauce. I’ve been staying away from nightshades so I didn’t add any. I’m the kind of person who loves flexibility in a recipe. And, I often change things up a little every time I make a recipe. Especially with savory recipes. 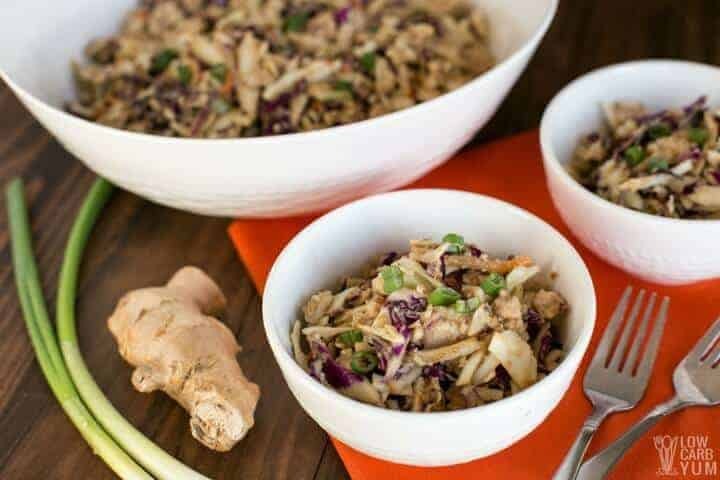 So, for those who love Asian dishes, you’ll definitely want to give this easy Thai chicken salad with canned chicken a try. It’s one of the simplest recipes ever. Also, if you aren’t a fan of ginger, you can leave that out. But, I love the getting it fresh versus taking ginger root pills to get the benefits. 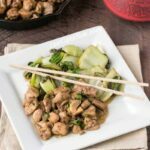 And, if you’re looking another easy Asian inspired dish, take a look at the keto lemon chicken. 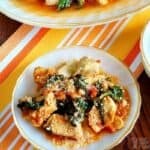 Other simple recipes are the chicken spinach tomato one pot dish and the summer zucchini and squash salad. If you’d like some simple beef salads, check out the Big Mac salad and the taco salad. 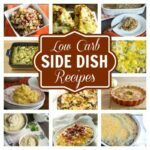 Do you have a favorite keto friendly salad recipe that you make over and over? 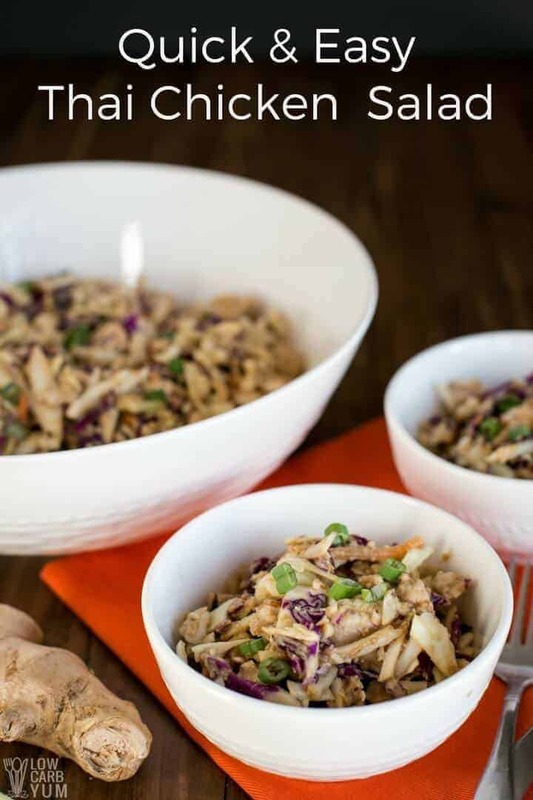 A quick and easy salad made with canned chicken and coleslaw mix. 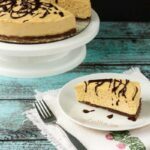 It's simple to prepare and made with budget friendly ingredients. Mix salad ingredients in large bowl. Set aside. Blend together dressing ingredients. 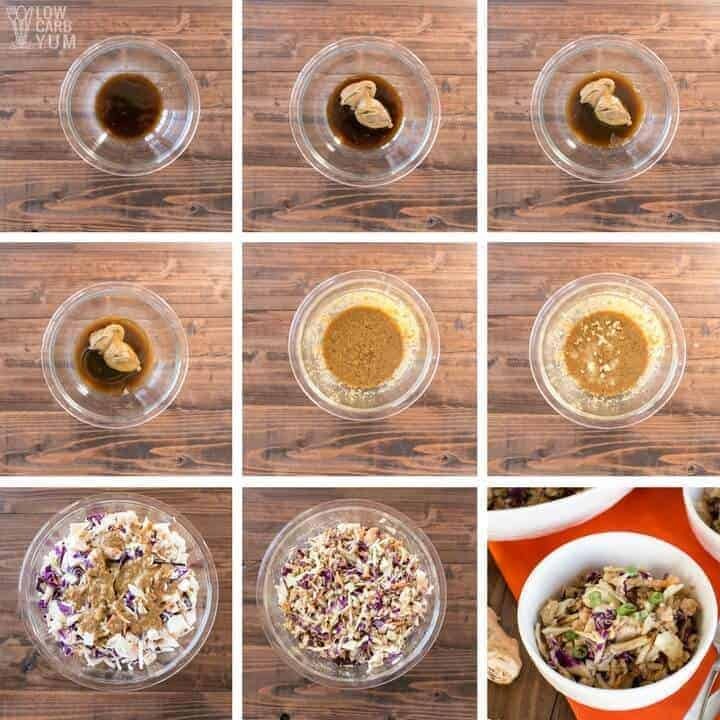 Pour over salad. Toss to ensure salad is evenly coated with dressing. Garnish with sliced green onion.